In a bowl, flavour the minced meat with olive oil, mix well, then combine also the others ingredients; season to taste and insert the mixture in a pastry bag. Set the lock on decoStick moulds base, completely fill the moulds with the mixture, making well adhere to walls, set the wooden supports make them slide into the mould at least for 1/3 of the length, and with the spatula spread the mixture, removing the excess. Protect with Ideabrill® paper or baking paper to prevent that the blast chiller air can ruin the product surface, and put into blast chiller, partially or completely deep freezing depending on needs. Demould, bring to room-temperature, serve and garnish as wish. 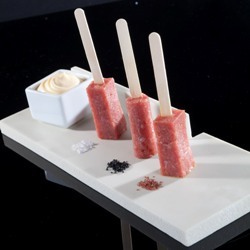 With the same procedure, changing mixture, it is possible to create any type of burger or meat croquettes, fish or vegetarian, fried or parched, always with stick for a tasteful buffet. The packaging Ideabrill® is eco-friendly and Freshness-keeper patented by Esseoquattro Spa. The tests carried out by the University of Camerino demonstrate that the preservation of foods increases and it has an insulating and protective action against light and air. Using this type of food wrapping, both in the preparation phase with the decoStick® mould, both during storage before being consumed, it will keep unchanged its characteristics, such as taste, odor, color. In a bowl, flavour the minced meat with olive oil, mix well, then combine also the others ingredients; season to taste and insert the mixture in a pastry bag. Place the black silicone lock on the mould base. Thanks to the elasticity of the silicone used for the base, the extraction of the individual forms is simple and immediate. If the product is properly cut down, the mould remains perfectly clean, ready to be reused. ...always with stick for a tasteful buffet.